The Ambassador Bridge is a suspension bridge that connects Detroit, Michigan, in the United States, with Windsor, Ontario, in Canada. It is the busiest international border crossing in North America in terms of trade volume: more than 25 percent of all merchandise trade between the United States and Canada crosses the bridge. A 2004 Border Transportation Partnership study showed that 150,000 jobs in the region and US$13 billion in annual production depend on the Windsor–Detroit international border crossing. Here's the our members favorite photos of "Bridges in Ontario". 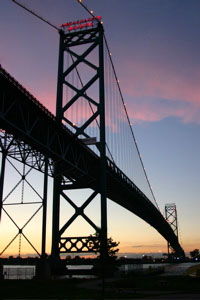 Upload your photo of Ambassador Bridge!